Average Height	: 16" - 19"
Average Weight	: 37 - 45 lbs. Contact: Lee Hildebrand. Karin Cartwright helps and may contact you. Originating in England in the 1800s, the Field Spaniel used to be considered the same breed as the English Cocker Spaniel. The dog was used to flush and retrieve both fur and feather from land and water. In the 20th century it was decided that anything above 25 pounds would be considered a Field Spaniel and anything below would be an English Cocker Spaniel, and the two were officially separated into different breeds. During the 1800s the Field Spaniel was being bred with a greatly exaggerated length and weight. Almost a hundred years later in the 1920s, the standard returned to a moderate length and weight. Although it is a fine bird dog with a great, mild disposition, the breed remains rare to this day, most likely due to the extreme popularity of the Cocker Spaniel. 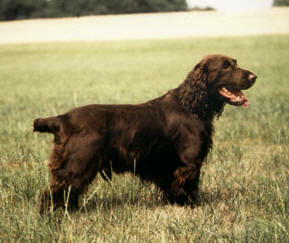 The Field Spaniel was recognized by the AKC in 1894. Some of the Field Spaniel's talents are tracking, hunting, retrieving and watchdog. The Field Spaniel is incredibly docile, calm, but also independent in nature. These dogs are smart, intelligent, and playful; they are also very active and can be full of energy. Field Spaniels make excellent family pets because of their drive to please and friendly nature, and they are especially good with young children because of their soft and docile presence. It is important that this breed is socialized well so that they do not become too timid; this is a natural trait and they can be very friendly and sociable once they break out of their comfort zone. If the dog is undersocialized in early years, it will be much less likely to interact with strangers. Field spaniels enjoy roaming and exploring, and are often involved with playing and activities. If play becomes too rough, however, they may become timid, withdrawn, and unsociable. It is important to monitor them in their early years so that they do not become temperamental in new situations. Tehse dogs have a tendency to become stubborn, but they are calm and placid overall. They become very happy when they have an activity to do or a project to complete; they are quick learners and will pay attention to direction and the owner's voice. Training the Field Spaniel is relatively easy and they are very sensitive to voice, tone, and manners. It is important to be direct and not too harsh with these dogs as they will pick up any nuances and behaviors immediately. A tough approach will likely disturb them and may result in reluctant behavior traits. The Field Spaniel's naturally glossy coat needs to be brushed and combed at least twice per week, minimally just once per week. Any straggling hairs and excessive hair can be cut every few months, and taking the dog to the dog grooming parlor on a monthly basis will take care of the basic necessities. Show dogs need a professional groomer at least four times per year, since this is where any dead hair can be removed with plucking. Hair may also be thinned out in the ears, legs, and neck area. These dogs are considered fairly high maintenance in the show dog field since they need consistent attention to keep their hair smooth, clean, and shiny. These dogs rarely shed hair. Bathing and shampooing is necessary when the dog has been playing in dirt, and it's a good idea to have the skin and ears checked by a Vet on a regular basis. Checking for ticks during tick season can prevent infection and disease, and nails should never be allowed to grow too long. Field Spaniels naturally have webbed feet and excessive hair may lead to too much moisture and infection. The Field Spaniel has roots as a working field dog and needs a lot of exercise. A field or large garden space is ideal for these dogs to run about and get at least a few hours of exercise each day. These dogs enjoy long walks, and can accompany their owners on nature trails, running, or running alongside a bicycle. It's important to keep the Field Spaniel on a leash as they have a tendency to explore a new environment simply by following their nose. They adapt easily to family settings and groups, and make valuable companions on trips. They need to be taken on at least 1-2 long walks per day, preferably on a leash. Fetching games and other outdoor toys are attractive to the Field Spaniel, but the ideal activities are running and walking. The Field Spaniel is naturally playful and will take part in activities with familiar owners or guardians. It is important to keep track of their whereabouts, especially in the dark. Field Spaniels have plenty of energy to play all day, and enjoy new environments and settings. Field Spaniels need a large amount of exercise so that they do not become neurotic or bored. They are very sensitive to nature, and can be quick to respond to shifts, changes, or loud noises. It is important to take them outdoors in a safe and nurturing environment; very young puppies should be trained and exercised at home before exploring larger territory. The Field Spaniel is a natural hunter and will have a tendency to get lost if they are left on their own. This breed stays healthy and happy when they have an opportunity to explore with their owners or guardians. Field Spaniels are naturally independent but they learn very quickly. They are commonly involved with play, and are docile by nature. Training these dogs is not difficult as they are intelligent and friendly and will be fairly open to learning new skills and activities. They will withdraw if they are treated roughly so it is important to be careful with the training process from the start. Younger puppies can be especially timid and shy, so creating a bond first will help overcome initial training obstacles. Field Spaniels have a tendency to bark too quickly and abruptly after slight sounds and events. They may not listen to commands or directions if they are afraid or anxious, so it is important that training takes place in a secure and non-threatening environment. These dogs require early socialization to prevent timidity, so taking them out to the dog park so that they can mingle with other dogs is very important. They may exhibit aggression later on in life if they did not receive appropriate socialization; it is important to remain firm, fair, and consistent to make positive changes. Field spaniels are especially valuable for hunting, retrieving and tracking. This is helpful for any activities that can help improve the dog's natural abilities and skills. Every puppy will need to be trained differently, and this is especially important for the youngest set of Field Spaniels. They can become naturally attached to just one owner, and helping them develop bonds with other members of the family and other dogs is an essential part of training. These dogs learn new tricks and skills naturally, especially when they are given the chance to run around and engage in physical activity. They are moderately active indoors, and will engage in a multitude of activities with owners on a regular basis. This provides plenty of opportunities for interaction and training. As watchdogs, the Field Spaniel can be trained to be especially observant and vigilant.